Ann Dunbar, has a way of not only creating and presenting a beautiful painting but possesses the ability to reach one’s soul and awaken the unconscious love of beauty that lies within us, her unique method of combining embroidery with painting on just the right paper took years of study and work but was finally able to capture the spirit and expression she sought. 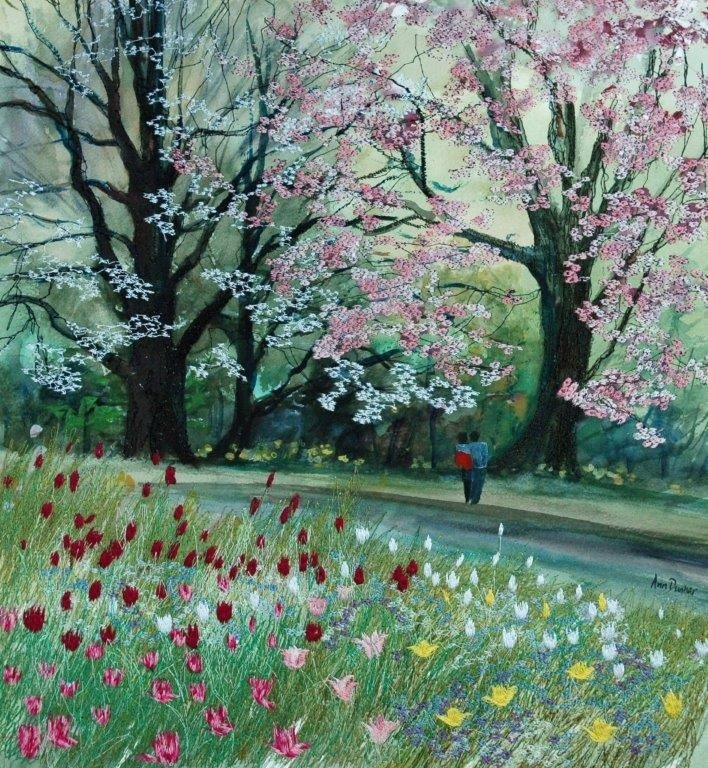 Born in Hampshire, England, Ann was encouraged by her parents and teachers to pursue her artistic ability as young as 13.Educated at Battersea College of Education, now Southbank University in London and West Surrey College of Art for an arts degree, she was further inspired to continue her art by winning first prize at an open art competition in London. Ann met her husband whilst at college and they were married in 1978. Ann then taught art to children and adults for sixteen years before she became an artist in her right in 1990. 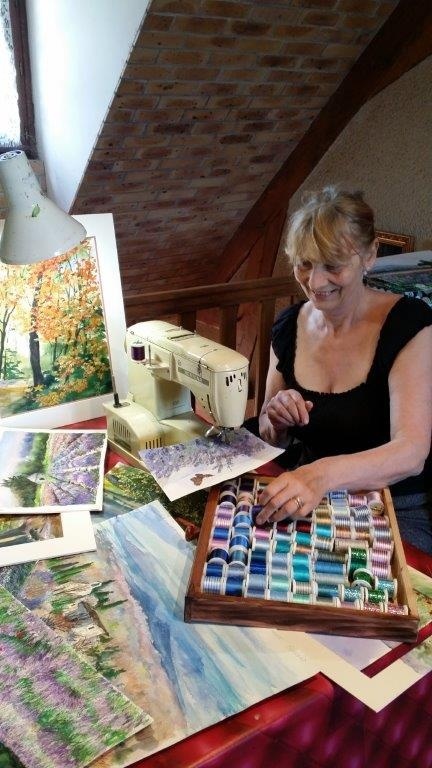 Ann now lives near Paris, France, due to her husband’s re-location, making the most of her surroundings, the effects of the colourful country-side, evident in all her work. 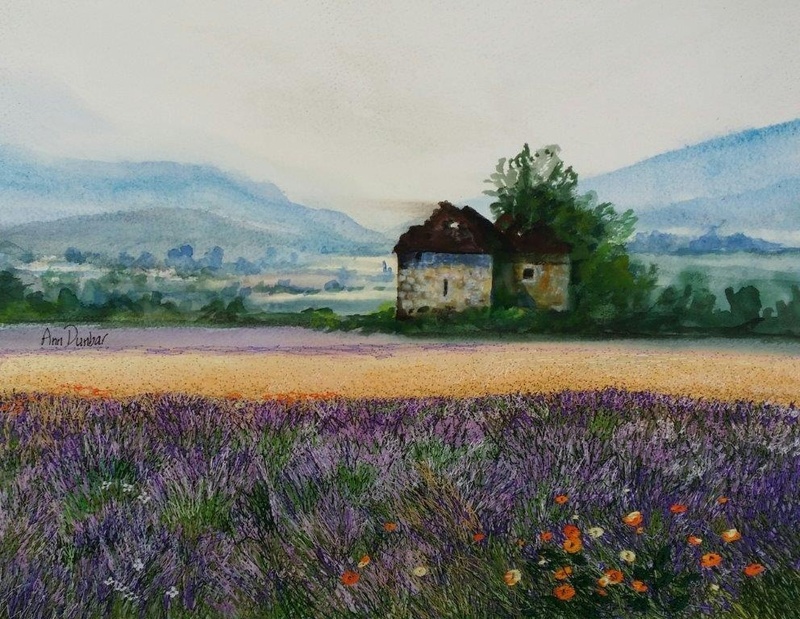 Picturesque floral villages with their window boxes overflowing with geraniums, bustling markets, wild flower prairies, glorious gardens and architecture, all unlock her inspiration for compositions. Foreign travel has also broadened her vision from the imaginative “dreamy” to the exotic bold compositions. Artists such as Turner, Redon, Van Gogh and the Oriental Asiatic style are her principle influencers. 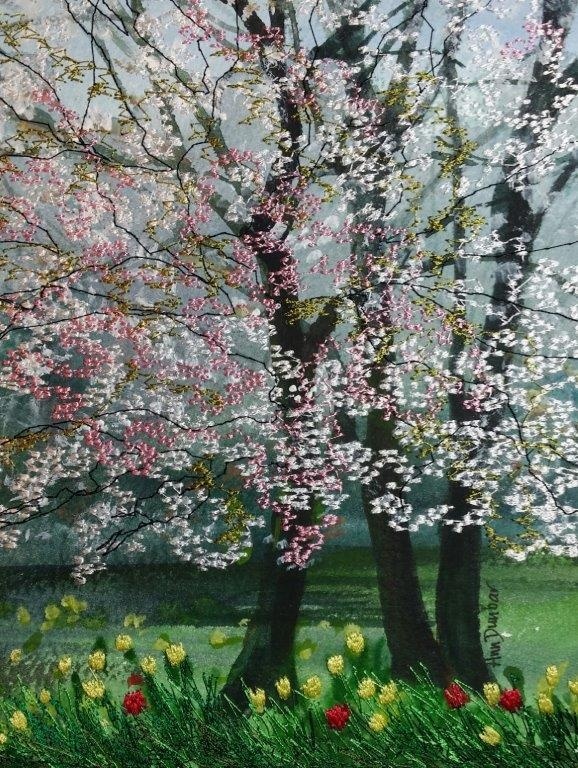 Today, Ann Dunbar is an internationally awarded artist with 30 medals and distinctions. Manhattan International Award for the “Healing power of art” USA online representation. Rubens International Award of high Recognition –Italia -in-Arte. Vermeil Medal – Institut Européen des Arts Contemporains. Her exhibits have travelled round the globe (Japan, China, Cambodia, Australia, and USA.) and she has collections in various embassies and cultural venues. She is represented by Shoalhaven Fine art gallery,NSW, Australia, Poala Trevisan International and ArtApart in Italy., Art & Miss Gallery in Paris, France .Online she is showcased by Manhattan Arts International, New York, USA. The effect of the light plays an important role in my creations. 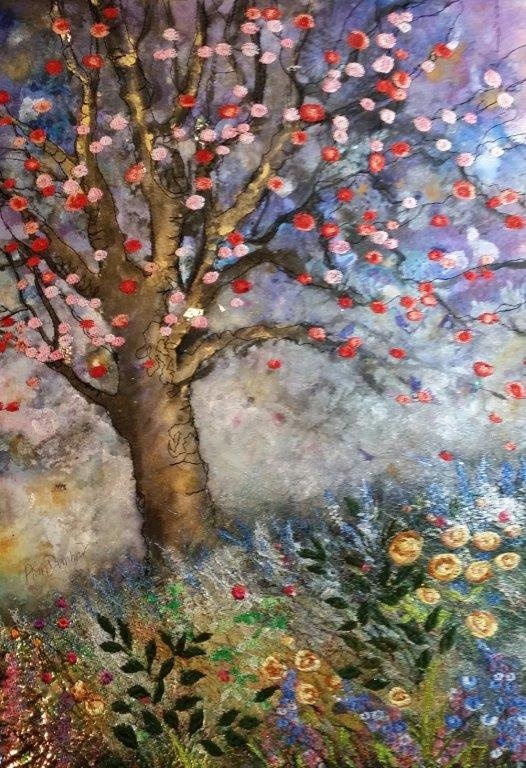 The enchantment of stitching embroidery to my paintings is the magic which reigns, bringing it alive with rich, textural, and decorative detail. 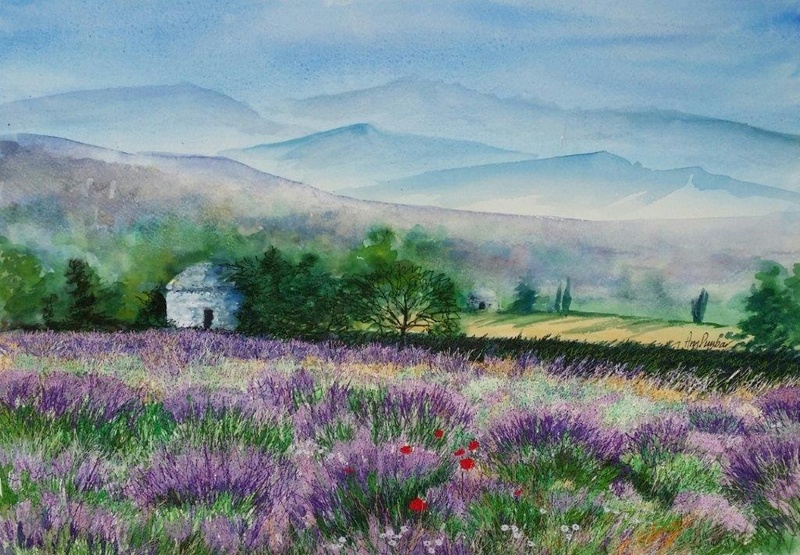 The translucent, ethereal background worked in watercolour mediums, provides the atmosphere and ambiance to the subject. 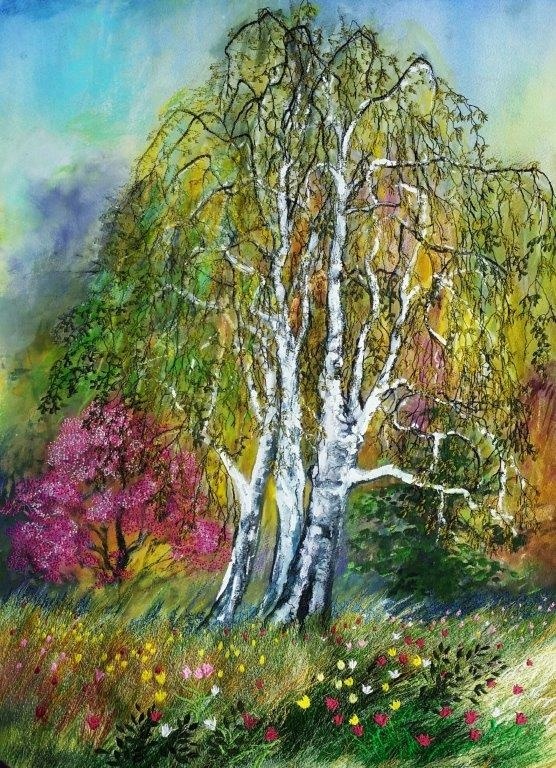 I employ ethereal backgrounds either with pure water colour or with many types of mixed media which gives the overall colourization and ambiance to the subject. Successive applications of paint act as a guide for the embroidery (freely applied by sewing machine), with silken threads which are super-imposed to achieve the same optical effects as the impressionists. For large panels, I collage prepared pieces with additional painting, onto canvas using “marouflage” techniques. When completed, the work is sprayed with archival varnish with UV protection for a transparent finish. 2016 - Memberships: Artcom Expo International Association of Artists . price as I have them already on my online boutique. mixed media with embroidery on paper. Title:Parc Parisien au Printemps / Dimension:60x80cm. Title:Spring ma / Dimension:50x40 . Title:Summer flowers in poetry / Dimension:24x30cm. mixed media with embroidery on paperitle. 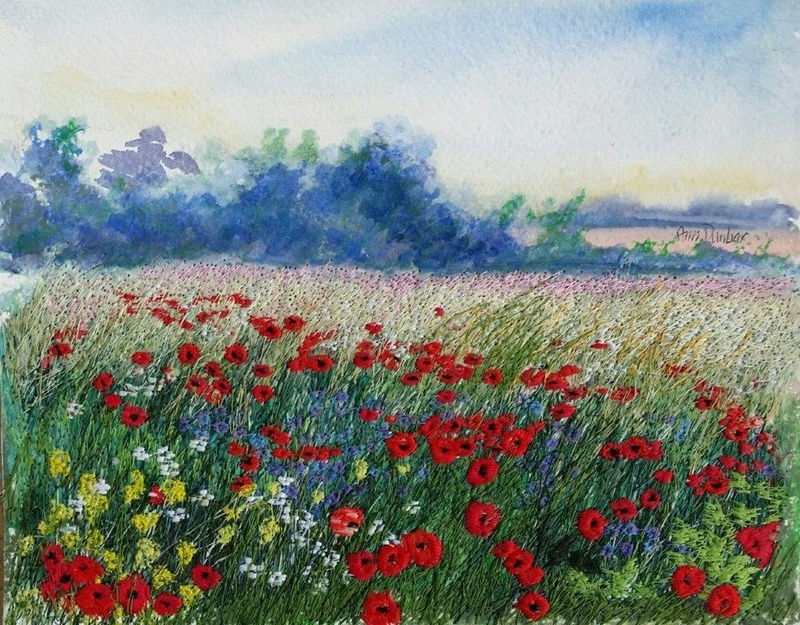 Title: Viva Valensole / Dimension: 32X40.5cm. Tmixed media with embroidery on paperitle.